Among casual listeners, opera aficionados, avocational vocalists, and professional singers alike, high notes are a constant topic of conversation. Take an impromptu survey about what actually constitutes a “high note,” however, and I’m willing to bet you’ll get a bevy of different answers, especially among vocalists. I know quite a few people who would love to see a baritone and a Rossini tenor duke it out over what constitutes a “high note”. The controversy doesn’t just end there, of course. Once he/she has determined what is a “high” and what isn’t, the beloved listener usually moves on to discussing the quality of the high note. Who has the softest high notes? Who has the loudest? Who can hold a high note the longest? Who can hit the highest note? Whose high notes are strident? Whose high notes are warm? Who cracked his/her high notes? The list goes on, and each of those questions could be answered an unmeasurable number of ways. The mind boggles, truly. But are high notes really all that important? Let’s explore this for a moment. Some arias are valued by many simply for their high notes. 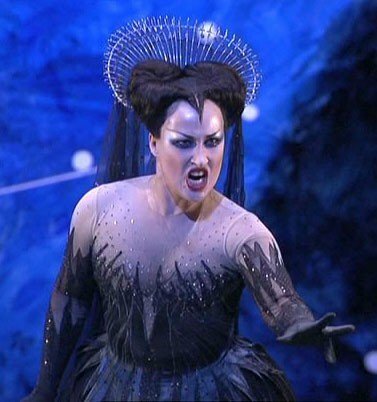 Case in point is the Queen of the Night’s famed vengeance aria from Mozart’s Die Zauberflöte, “Der Hölle Rache”, which features staccato F6s over soprano high C. It’s so famous, even your non-opera loving friends at parties want to hear you sing it, regardless of your voice part! And, if you’re like me, you’ve attempted those high Fs in the shower when you’re feeling feisty. And I’m sure you thought, just as I did, that you looked like this. If I happen to be amongst the sample of people you’re surveying about whether or not high notes are important, my answer might surprise you. I’m a soprano, so, one one hand, of course high notes are important to me. They are, in essence, what differentiates me from lower voice types–the timbre of my upper range and the quality of my high notes distinguishes me. But I do know more than anything that high notes are a means to an end: they communicate the meaning of the words the composer and/or the librettist/poet have given us. A glowing high note does not truly sparkle unless it is motivated by the meaning of the word behind it–and the examples above prove the point. So, dear reader: weigh in! Are high notes important? What do you listen for in high notes, if anything? Love ’em? Leave ’em? Who cares? Great points, Georgeanne!!! The video you posted of Caballé is truly magical. You are right that a note doesn’t have to be in the stratosphere to make a point!!!!!!!! Can’t wait to read more from you. High notes are the cherry on top of the cake for tenors and sopranos. You can sing extremely well the whole performance, but when it comes to hit that famous “High C”, when everyone awaits and you missed it you kind of blow your entire performance. Andrei, I definitely think in some circumstances, the high note is what people remember–for instance, people remember those Fs in the vengeance QOTN aria! But other high notes are not as important.